In recent years an atomic force microscope-based technique called nanoscale thermal analysis (nanoTA) has been employed to reveal the temperature-dependent properties of materials at the sub-100 nm scale. Typically, nanothermal analysis works best for soft polymers. Researchers at the University of Illinois at Urbana-Champaign and Anasys Instruments, Inc. have now shown that they can perform nanoscale thermal analysis on stiff materials like epoxies and filled composites. "This new technique lets us measure temperature and frequency-dependent properties of materials rapidly over a wide bandwidth," noted William King, the College of Engineering Bliss Professor in the Department of Mechanical Science and Engineering at Illinois, who led the research. The technique works by flowing a current around the U-shaped arms of a self-heating atomic force microscope (AFM) cantilever and interacting that current with a magnetic field. The magnetic field allows the tip-sample force to be modulated right near the tip of the AFM. "We are able to achieve nanometer-scale force control that is independent from the heating temperature," according to Byeonghee Lee, first author of the paper. "Conventional nanothermal analysis has struggled with highly filled, highly crosslinked materials and sub-100 nm thin films. This new technique has allowed us to reliably measure and map glass transitions and melting transions on classes of materials that were previously very challenging," said Craig Prater, chief technology officer at Anasys Instruments and co-author on the paper. 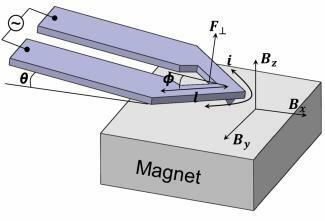 The paper title is "Magnetic Actuation of a Heated Atomic Force Microscope Cantilever using Lorentz Force," and was published in the journal Nanotechnology (doi:10.1088/0957-4484/23/5/055709). The research was performed in King's Nanoengineering Laboratory and at Anasys Instruments. King is also affiliated with the Department of Materials Science and Engineering, the Department of Electrical and Computer Engineering, the Beckman Institute for Advanced Science and Technology, the Micro and Nanotechnology Laboratory, and the Materials Research Laboratory, all at the University of Illinois. The research was sponsored by the Air Force Office of Scientific Research and the National Science Foundation.